Spring just says granola, doesn’t it? Or muesli? Whatever you call it, however you make it, wherever you buy it, granola is all about crunchy and earthy goodness mixed with milk and not-too-sweet sweetness. Yum. But I have a confession. I just made my first batch. I’m not a very good More-with-Less simply living Presbyterian/Mennonite am I? Sharp Shopper here in Harrisonburg, the go to place for all things bulk and natural, has sliced almonds for about $8.95 a pound (does anyone get them cheaper, truly wondering here?). And now I know. 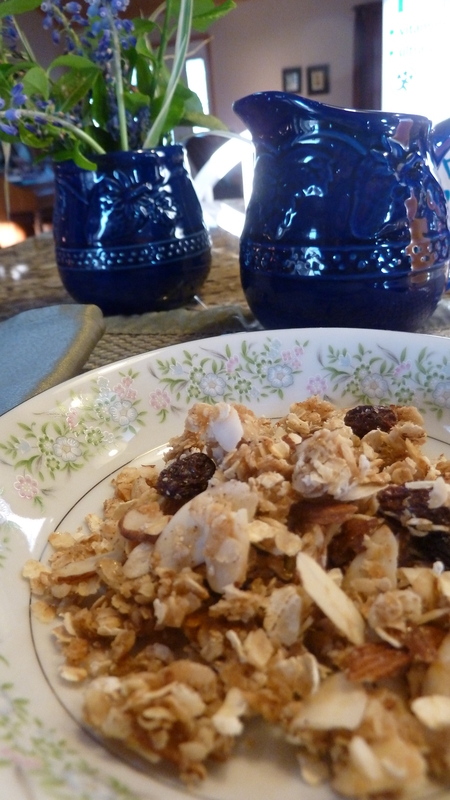 This granola is so simple to make there just is no excuse. I whipped up half a batch Saturday while waiting for my husband to clean up and get ready to go to town. I whisked it out of the oven as we headed out the door, and popped it into the microwave to cool (out of the way of the cats). It is just as good as I remembered, and says spring just as well. I should do the math on which way (purchased or homemade) is cheaper. And now I have a little surprise waiting for my daughter on her next visit. Pay back. 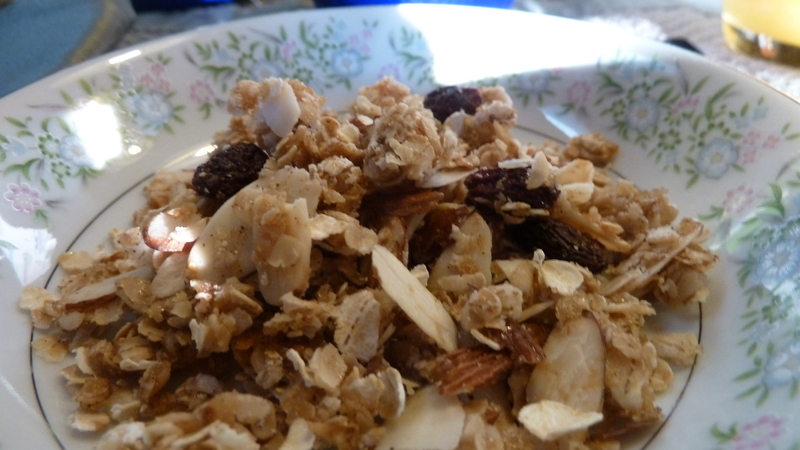 Here is Doreen’s Granola, adapted slightly from Weight Watchers website. This is way simpler than any of the ones in my other fav books for this kind of recipe, More with Less or Mennonite Recipes of the Shenandoah Valley. Weight Watchers gave a serving size as one cup which may seem reasonable until you start actually counting calories. At my age, I try to limit myself to 1/2 cup which is plenty satisfying and makes the good stuff last longer. Whisk 1 teaspoon vanilla into sauce pan once honey and oil are warmed through. 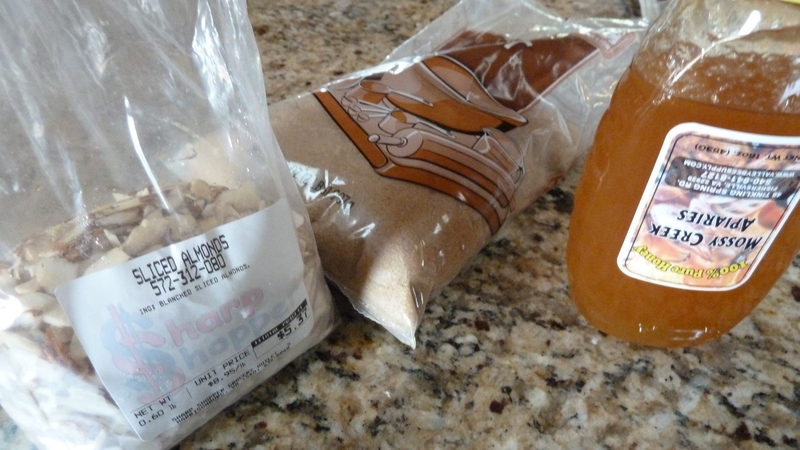 Carefully pour hot mixture onto dried mixture and stir gently or mix by hand. Spread into a 15 x 10 x 1 inch baking pan, lightly greased. Bake 15-20 minutes, stirring carefully every 8 or so minutes. Cool completely Add raisins or dried cranberries as desired, after cooking. (Fun fact: I accidentally added my raisins before baking and it was so cute watching those little raisins plump right up into brown puffy oblongs, which kids might enjoy watching. They [the raisins, not kids] shrink after cooling.) Store in airtight container for a week or freeze for 3 months. What have you learned to cook, bake or like because of your son’s or daughter’s example? I’d love to hear about their dishes. In my book, Whatever Happened to Dinner: Recipes and Reflections for Family Mealtime, there’s a chapter that includes recipes my kids came up with themselves or enjoyed cooking early on. Almost 100 recipes in all. More on the book here. Almonds are 5 dollars a pound at Costco, but they’re not sliced. Thanks for the Costco price, yeah, the slicing is a problem! I guess chopping them works too for granola, not so much if you truly want sliced almonds. 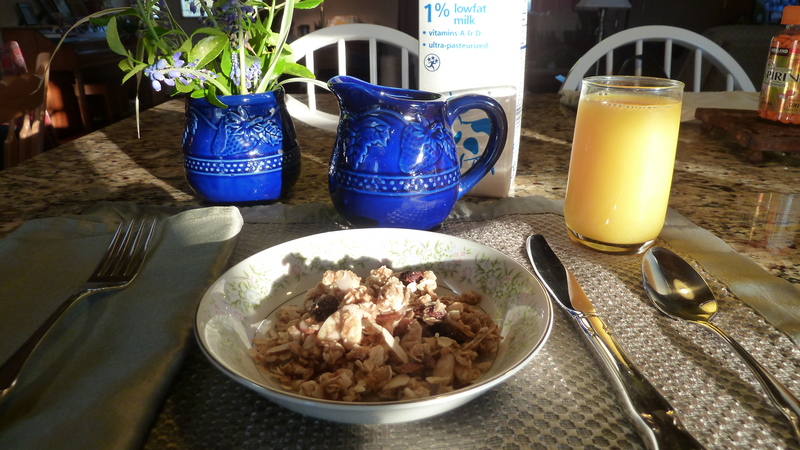 I can think of nothing better than granola with yogurt and fresh fruit for breakfast. A dash of honey would come from our son’s urban hives, local for us. My daughter-in-law is a cook extraordinaire and I have several of her recipes but often I just make the fall-backs, one of which is herbed chicken in “Amish Cooking” (Publications International, Ltd.) and super easy. Kudos to the next generation. Isn’t it great to go enjoy wonderful cooking at your daughter-in-law’s house? I’m with my daughter right now and she quickly and her husband quickly grilled some zucchini spears light tossed in olive oil and garlic salt. I had not thought of cutting them into spears like that. Your herbed chicken sounds good and would go well with that too!